The ensemble of worksheets featured here is a natural successor to the Number names worksheets containing numerals up to 3-digit. 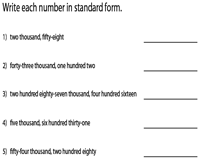 Guide your children in writing the appropriate number names or numbers with this assembly of worksheets that comprise 4-digit, 5-digit and 6-digit numbers. Click on the 'Download the complete set' option to obtain access to all worksheets here. 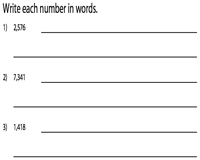 Test your child's ability to spell and write the number names for this series of worksheets that have been classified into 4-digit, 5-digit and 6-digit numbers. Download these worksheets for a great learning experience! Each worksheet featured here contain numbers in the thousands. 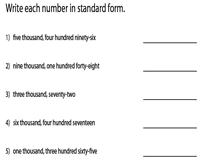 There are eight numbers in thousands featured in each worksheet. Write the number word for each numeral. Read each number name and write the correct numeral that represents the number word. The worksheets have been split into 4-digit, 5-digit, and 6-digit number names to ensure smooth downloads. 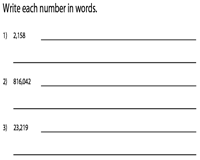 Each worksheet contains an assortment of 4 - digit, 5-digit and 6 - digit number names. 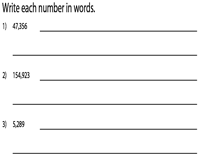 There are 12 number words included in each worksheet. Write each number word in standard form. 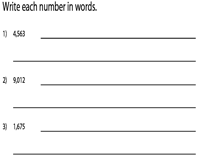 This group of combined review worksheets have been segregated into 4-digit, 5-digit and 6-digit numbers. It forms a perfect tool in gauging a child's aptitude to represent number names for numerals in thousands and vice versa. This batch of mixed review worksheets provides for ample practice and also helps reinforce the concept of writing 4-digit, 5-digit and 6-digit number names in standard form and vice versa. Use the answer key to verify your responses.